I love walking around Ubud and its neighboring banjars (hamlets). Not so much for the ease of getting around (though, in all honesty, the sidewalks are still, in some places, blocked by parked bikes and a hazard), but for the magical, surprising, unexpected, surreal and just plain weird things I notice. That – and the possibility of getting up close and a little more personal with the locals – is really what keeps me on the walking path. A day doesn’t go by that I’m not wowed or puzzled by some of these sights. It could be a baby carriage made of straw, totally out of place in an island like Bali, where babies are not even allowed out of the family compound before a ceremony has been held to mark their 3-month birthday. Whose is that? It could be a pickup, transporting on its rear open bed, a gamelan set – or a whole lot of plants and trees – a traveling nursery. It might be a distant vision that stops me in my tracks, for the first time seeing that each and every bit of ornamentation affixed to the platform made for Padangtegal’s pelebon (high caste cremation) of the recently-deceased high pedanda (high priest) is in pure white – signifying purity and sacredness – with not a color in sight. 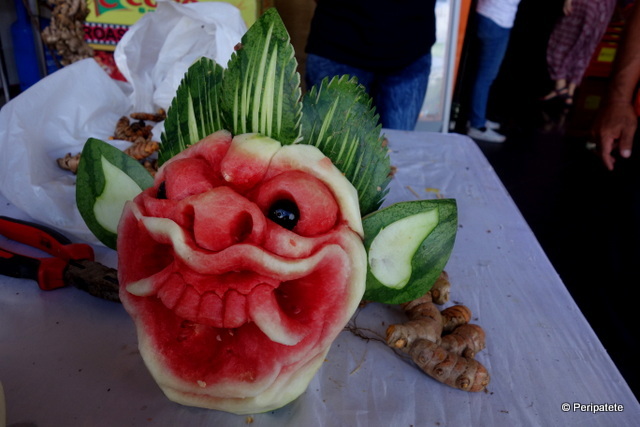 It could be a juicy watermelon being cut, sliced, molded and crafted into a traditional Barong mask. Or it could be the façade of the decades-old, legendary Tjampuhan Hotel – the first hotel in Ubud, where the artist Walter Spies lived for a time – being the only piece still standing from an extensive renovation that is getting underway. But all of these sightings still pale next to that which was (or should I say, those who were) spotted recently on Monkey Forest Road, one of Ubud’s main tourist-filled arteries. It won’t look like much to any of you, just a woman and girl walking ahead of me. But to me, that backside image (be still my beating heart!) nearly propelled me towards them, wanting so badly to wrap my arms around their shoulders. So powerful was this sight that it nearly brought me to tears. There, in the flesh, were my older sister and niece. I was sure of it. It couldn’t be. And yet. I walked behind them a few paces, as if in a trance, the surrounding sounds and people fading away, mystified as I was at the resemblance, their walking pace, their interactions. As if on a mission, I would have followed them until the end of the road. As it happened, they stepped into a shop. At which point, I turned on my heels – with a heart beating hard and my emotions on high – and headed straight home; the only place in which to hold onto that stupendously strange, intimate, sacred, fleeting and precious moment. Like the whiff of my grandmother’s perfume that made me turn to frantically look for her even though she’s been gone for twenty-five years.